1. Using Smeargle with move set suitable for what you are persuading. 2. You can teach your Smeargle any move by Ditto Method. 3. 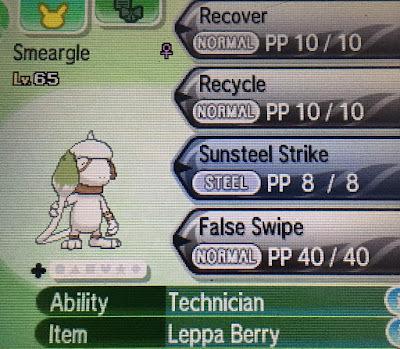 Make sure your Smeargle has the best IVs by breeding. 4. Use False Swipe to lower the pkm's health to 1 HP. 5. Some pokemons sometime call a different species pokemon for help, which will attacking them upon appearing. Make sure to kill them immediatetly or your S.O.S chain link will be terminated. 6. Some pokemons rarely call for help, and they might fall down by Struggle before the pkm you are hunting appear. You can use a pokemon with Harvest Ability, holding Leppa Berry, having Skill Swap and Trick and bring them to the pokemon you are catching. With Harvest ability and Leppa berry, they can recover their moves whenever their PP drop to 0.